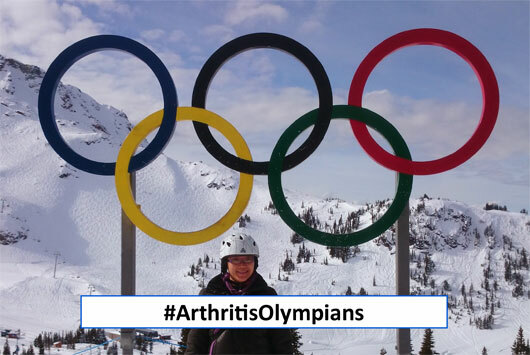 We are #ArthritisOlympians – Let the Winter Games begin! Arthritis Consumer Experts (ACE) has created the #ArthritisOlympians campaign to support athletes in the 2018 Winter Olympics and Paralympics games and recognize that people living with arthritis are Olympians in their own sense. Olympic athletes must train rigorously in preparation for the Games. Beyond training for their specific event, everything from diet, rest and mental health are keys to success. Olympians rely on support from their team, care from medical staff and guidance from coaches to ensure they are prepared for all challenges that may come their way. Arthritis patients use similar practices in their lives. We are #ArthritisOlympians – confronting pain and fatigue with the support of our healthcare team to overcome daily challenges. The #ArthritisOlympians campaign runs during the 2018 Winter Olympics and Paralympics games from February 9-March 18. Throughout the campaign, we will highlight the parallel ways Olympians and #ArthritisOlympians manage their health to achieve their personal bests. Please feel free to invite your friends, family, and colleagues to participate and provide comments on #ArthritisOlympians moments.